Simple and elegant, the Trinity is a beautiful cluster canvas arrangement designed to focus on your favorite subjects. Perfect for centering above your couch, bed (or Sofa bed), mantel or any large empty space, The Trinity will draw attention to your space and warm up any room. Choose 3 of your Favorite Vertical photos and create a decor ensemble that will make you smile each time you enter the room. Share your happy moments with your guests and relive your best memories each day with beautiful canvas prints. The Trinity will create a focused touch to your most precious moments. When taking pictures of special moments in your life, you are not just taking photos to keep it locked up in your camera or cell phone. You want to enjoy that moment and relive those smiles over and over again! What better way to relive each treasured memory than to print your digital photos on canvas? Your canvas will recreate smiles for you to enjoy with the professionally wrapped and sealed backing. Ready to hang, your canvas will be enjoyed by everyone regardless of the occasion. Every milestone can be captured and appreciated each and every day with a gorgeously wrapped canvas. Grab the kids and head to the beach for a beach day photo shoot. Know someone preparing a wedding? Take The Trinity from the wedding to your home. It is the perfect canvas cluster for engagement photos to be easily displayed at the reception to add that personal feeling you are looking for. At the end of the night, hang them in your new home to celebrate the beginning of your love journey. Have a photo shoot scheduled on the calendar? The Trinity will beautifully display three of your favorite photographs from that fun filled day. Whether the photo shoot is to highlight your adorable twins, your beautiful family or the graduate you are so very proud of, The Trinity will continue to spread smiles all around with this elegant arrangement. Showcasing the center canvas is easy with this cluster canvas arrangement. The two 16x24 canvases on either side add just the right amount of dimension to tie the focus back into the larger 24x36 canvas in the center. Print a photo of the whole family on the center canvas and get your two favorite photos of the kids on the two side canvases. Why not give it as a gift to grandma and grandpa to show them how much they mean to you! They will be so pleased to see their children and grandchildren on stunning gallery wrapped canvases that they can enjoy at every moment of the day. If you have more favorite memories that you want to display, our Center Focus Five is also another great option for elegantly showcasing your most family photos. With so many special occasions throughout the year, there are endless possibilities to capture beautiful smiling faces. Take advantage of every moment and snap a picture or two that can be used to give your home that warm cozy feeling. A great cluster collection to highlight a milestone anniversary, wedding or just a beautiful day at the park. With The Trinity you can print your digital photos to canvas and feel the reassurance that your precious memories will last a long time. Wedding and engagement pictures are some of our favorites to print on cluster canvas arrangements. The timeless photos are the perfect pairing with a classic, professional quality canvas. With all the pictures your photographer, family and friends will be taking you will have so many options to choose from. Pick your top three favorite wedding pictures or get that wedding kiss printed on the center canvas and a few fun candid shots from your engagement photo shoot for the two smaller canvases. Are you celebrating a special birthday soon? Do you want to print your son and daughters 1st birthday pictures on canvas but want to include a nice family picture as well. 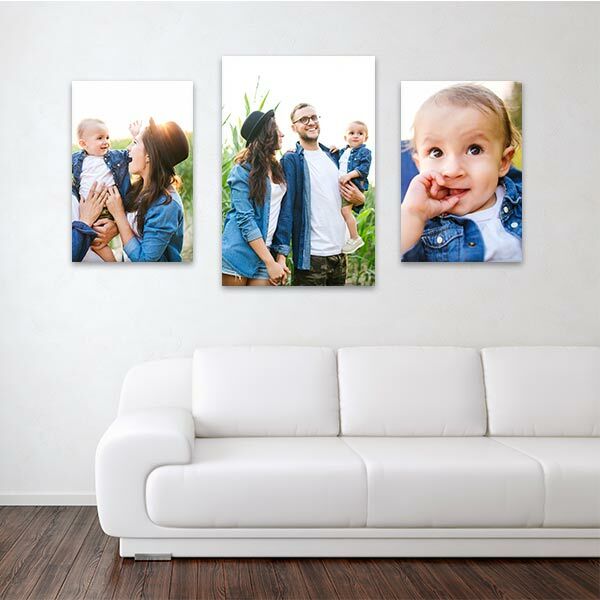 With The Trinity you can print the family picture on the center 24x36 canvas and the precious 1st birthday pictures of each on the two 16x24 canvases. With a wrapped finished look, guests will be gathering to admire your stunning canvas photo prints. Gathering family during the holidays can be the perfect time to get some great pictures for your home decorating projects. Everyone is already dressed up and looking sharp, why not get your favorite people to pose for you and share a few smiles! Get a few pictures of the kids with grandma and grandpa or sit them down for a family group picture. Either way, getting your entire family together for pictures can be a fun experience for everyone. If you don’t see the entire family for the holidays maybe the next family reunion is the best place to get a group picture of everyone. Coordinating a black or white colored top with blue jeans on everyone is a great way to create classic, yet unique family photo. If taking these photos outdoors, there are many options to get fun relaxed photos that will get everyone smiling. The Trinity is the perfect arrangement to display your beautiful new family photos. Print a nice classic pose on the larger canvas and the fun candid shots on the two smaller canvases to show your guests what your family is like behind the scenes. A perfect display of the family you love and adore. The Trinity can be the centerpiece to a growing collection of memories displayed on your wall or the single canvas cluster that creates the perfect warmth for your home. However you choose to arrange your canvases, the three photos chosen to be printed on The Trinity will surely be capturing attention. Printing your digital pictures to canvas can bring smiles to your family and friends. Everyone who stops by for a visit will be able to appreciate the moments you have come to cherish and adore. The Trinity canvas cluster includes one 24x36 wrapped canvas and two 16x24 wrapped canvases ready to draw the focus in on your photos. The special moments you have enjoyed together with your family will receive the attention they deserve when printed on a ready to hang professional canvas. All photographs will be emphasized with beautiful arrangement and subtle texture of your printed canvases. Each canvas will be delivered with a professionally sealed back, ready to hang. Adding any digital photo to canvas creates a professional, yet personal touch to the decor of every room. Want to add some decor to a shelf in the kids rooms? If you prefer a thinner, lighter canvas our Canvas Lites may be a good option. Small, flexible and versatile these canvas minis are great for placing on an end table, mantle or shelf. Ready to be enjoyed in minutes, you will warm up any room without worrying about glass breaking if the little ones get curious. Decorating your home or office with Floating Framed Canvas creates a professional, polished look that ensures every photograph gets the attention it deserves. The optional black or walnut frame will surround the canvas perfectly, leaving the canvas wrapped edge visible and giving your photo a three-dimensional look. It is a stunning option for wedding photos, landscapes, graduation portraits or any special memory you want to bring more attention to.